There have been so many false alarms warning of inflation’s imminent return over the past decade that it’s hard to keep track. There was the initial unease after the Federal Reserve cut interest rates to zero, and another scare when it started buying up massive quantities of bonds. And then the time the European Central Bank drove its benchmark rate into negative territory. The titans of the bond-investing world are undaunted. Many of them are once again predicting — and, more importantly, actually gearing up for — a pickup in inflation. Pioneer Investment Management, for instance, is setting up the first-ever global inflation-linked bond fund in its 88-year history. Partly with that same threat in mind, Pacific Investment Management Co. is cutting the duration of the bonds it holds in its $63 billion Income Fund. This time will be different than those previous episodes, they say, because fiscal policy rather than monetary policy will serve as the principal driver of higher prices. From the U.S., where both presidential candidates are promoting stimulus plans, to Japan, where lawmakers approved a $46 billion infrastructure program, to the U.K., where the Chancellor of the Exchequer has indicated he could ramp up spending, talk of fiscal largesse is in the air. The shift in the debate is in part something of an acknowledgment that lax monetary policy, for all the work it did propping up the global economy in the wake of the 2008 crash, ultimately failed when left on its own to bring the rates of growth — and inflation — back to pre-crisis levels. Fiscal stimulus, the thinking goes, will be more effective at putting cash immediately in the hands of consumers. Marasciulo said Pioneer saw an opportunity for a global inflation-linked bond fund after an analysis of long-term expectations showed traders don’t see price increases reaching central banks’ targets any time soon. In the case of the euro region, traders anticipate it won’t happen for at least the next 30 years. In the U.S., years of monetary easing helped push Treasury 10-year yields to a record-low 1.318 percent last month and cut the unemployment rate in half, from a peak of 10 percent in 2009. 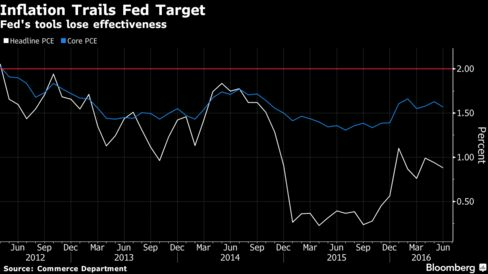 Yet inflation has trailed the Fed’s 2 percent target since May 2012, a consequence of sluggish growth. The central bank’s preferred benchmark, adjusted to strip out volatile energy and food components, rose at a 1.6 percent rate for the 12 months ended in June, up from a post-crisis low of 0.95 percent in December 2010. After underperforming for the past three years, U.S. sovereign debt tied to the outlook for inflation has been a winner in 2016. Treasury Inflation Protected Securities, known as TIPS, have returned 6.2 percent this year, versus 4.8 percent for conventional Treasuries, according to index data compiled by Bloomberg. Global inflation-linked bonds have returned 10.4 percent this year. 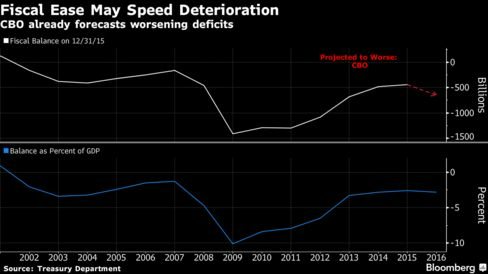 Canada and South Korea are among countries that have already rolled out fiscal stimulus, taking advantage of global borrowing costs near record lows to finance infrastructure spending and spur growth. Consumer prices in Europe have been subdued in recent years despite periodic false alarms. In the euro region, headline inflation spiked from a record low of minus 0.7 percent in July 2009 in the aftermath of the global financial crisis to around 3 percent in 2011. It then dropped again and has been below the ECB’s target since February 2013. While inflation in the U.K. rose to 0.6 percent in July, the highest since November 2014, it remains below the Bank of England’s 2 percent target for a 31st month. Many investing luminaries have been proven wrong in recent years warning stimulus would fuel economic growth, stoke inflation and hurt bond prices. Strategists have also misfired forecasting Treasury yields would climb, only to watch them fall further. Expectations that rates would rise fueled a surge in popularity for unconstrained bond funds, which aren’t tied to benchmark indexes and were largely designed as a way to minimize interest-rate risk. In recent years asset managers from to Janus Capital Group Inc. to DoubleLine Capital LP launched funds based on similar strategies. Calls for higher inflation sparked by fiscal stimulus face practical hurdles, especially in the U.S., according to Scott Minerd, who as chief investment officer for Guggenheim Partners oversees $240 billion. The nonpartisan Congressional Budget Office forecasts that for the current fiscal year to end Sept. 30, the U.S. deficit will rise to $590 billion from $439 billion in 2015. That would mark the first annual increase since 2011. Since peaking at $1.4 trillion in 2009, the U.S. deficit had plunged as government spending slowed and tax receipts rebounded. The deficit as share of America’s economic output is 2.8 percent, down from 10.1 percent at the end of 2009. 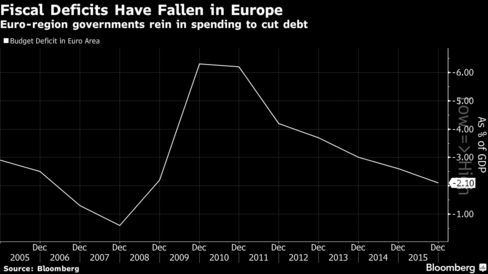 Most euro zone countries have adopted fiscal austerity as a way to rein in borrowing following the debt crisis that started in 2009. The region’s fiscal deficit has dropped from 6.3 percent of gross domestic product to 2.1 percent last year. It’s forecast to fall further to 1.9 percent. Economists at JPMorgan Chase & Co. this month said fiscal policies will add to world output for the first time in seven years, forecasting a 0.1 percentage point boost to growth in 2016.